Mike Ullery | Daily Call Kody Shade of Covington spreads “ice-melter” on a sidewalk in Piqua on Tuesday morning following a night of snow around the area. Shade works for Monroe Grounds Maintenance out of Troy. Kody Shade of Covington spreads “ice-melter” on a sidewalk in Piqua on Tuesday morning following a night of snow around the area. Shade works for Monroe Grounds Maintenance out of Troy. 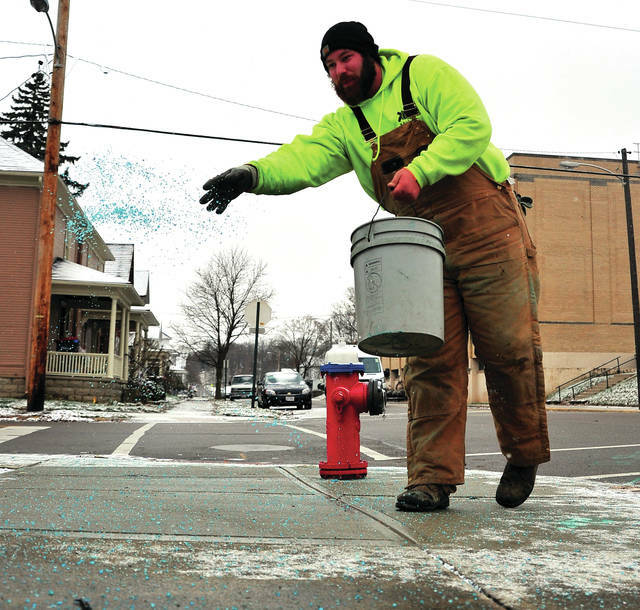 https://www.dailycall.com/wp-content/uploads/sites/30/2018/11/web1_112718mju_piqua_icemelt-1.jpgMike Ullery | Daily Call Kody Shade of Covington spreads “ice-melter” on a sidewalk in Piqua on Tuesday morning following a night of snow around the area. Shade works for Monroe Grounds Maintenance out of Troy.